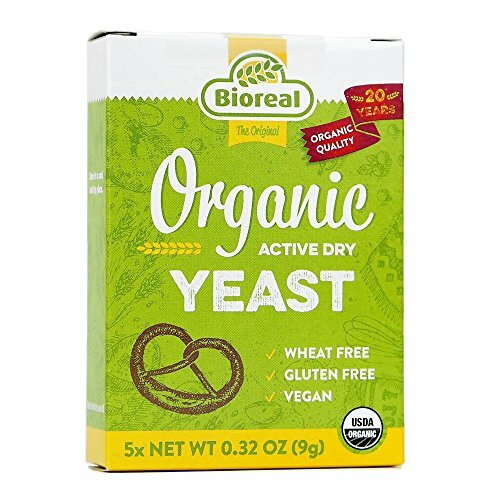 Bioreal organic yeast is the only totally organic commercial baker's yeast on the market. Bioreal provides the same reliable and excellent performance as conventional yeast yet it's processed without chemicals and is non-GMO. Organic yeast is better for you and the environment. Conventional yeast production uses harsh acids, bases (like lye, also known as sodium hydroxide), synthetic vitamins, ammonia and ammonium salts, and anti-foaming agents. With certified organic yeast production, all the raw materials used are 100% organic, benefiting the entire organic supply chain. Bioreal organic yeast is widely regarded as being superior in flavor to conventional yeast, bringing a heartier taste. We have found it to be very popular among bakers and pizza makers alike. Use: Mix contents with flour (do not dissolve directly into liquid) and use as per any typical yeast recipe. Storage: Once opened, place the pack of yeast into an air tight bag or container and store in a cool and dry place or your refrigerator. The yeast has excellent keeping qualities with only around a 15% drop in yeast activity at 12 months. This yeast contains none of the preservatives you'd find in non-organic yeast, and is not suitable for freezing. Note: Bioreal yeast is not as fast acting as typical commercial yeast. It performs more like a natural live sourdough starter.